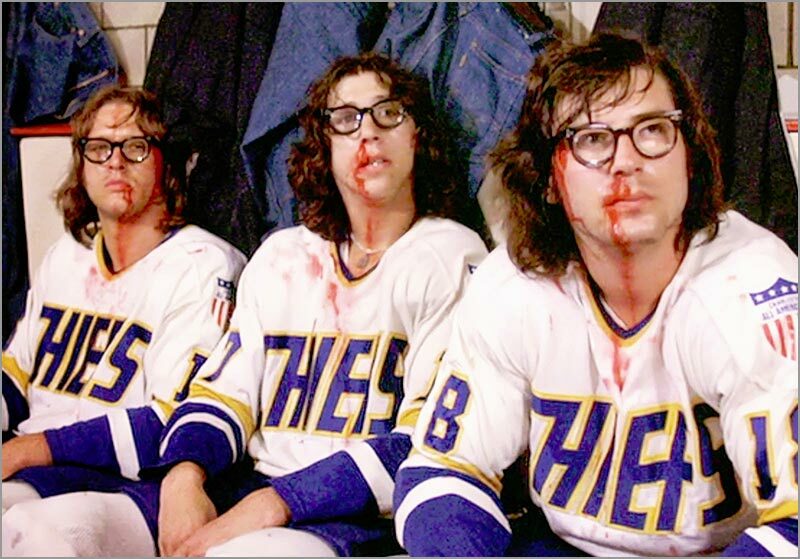 Hands-down, the most iconic characters from Slap Shot are Jack Hanson, Steve Hanson and Jeff Hanson — known as the Hanson Brothers — played by Dave Hanson, Steve Carlson and Jeff Carlson, respectively. 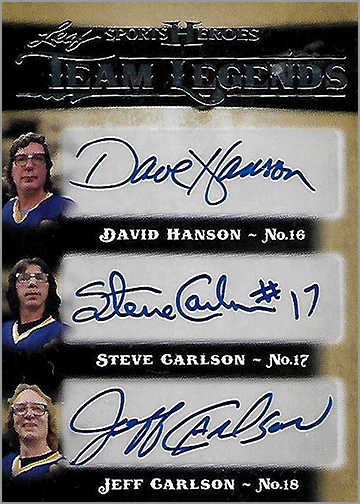 Each Hanson brother also appears on cards individually. 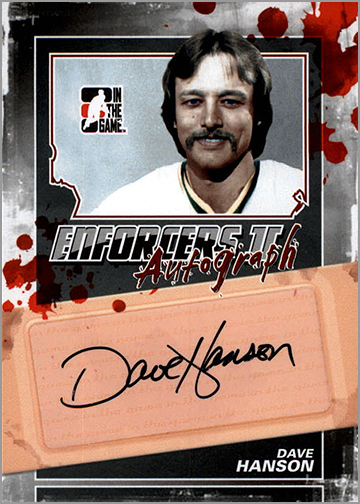 Dave Hanson had only one card made during his career, as a member of the Indianapolis Checkers, in 1982-83. 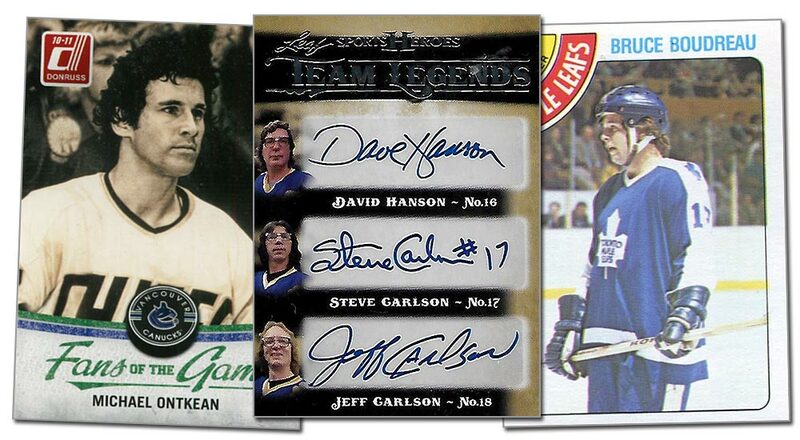 About three decades later, both Panini and In The Game made cards of Hanson. 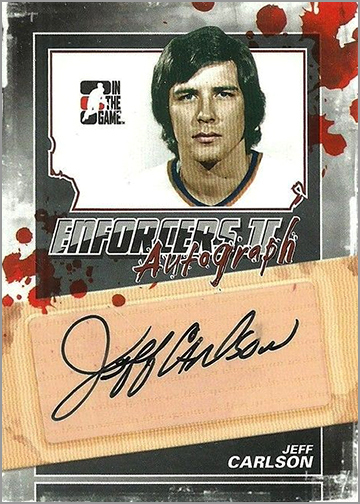 Jeff Carlson played seven games in the WHA and the rest of his career in the minors. No cards of him were made until well after he retired. 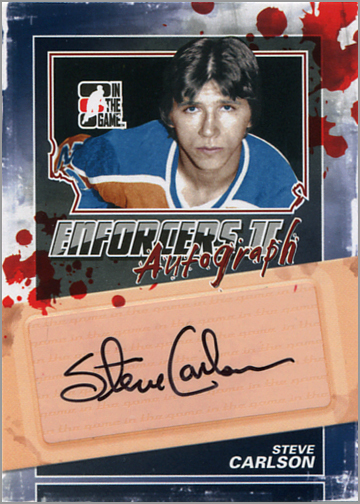 Steve Carlson played in the WHA and NHL, but only had a few minor league cards made during his career; good luck finding those! However, he had some more mainstream cards released within the past decade. 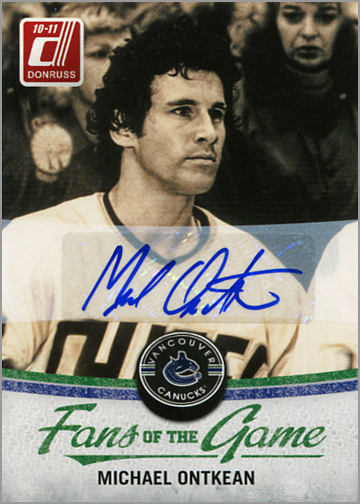 Ned Braden, the Cheifs’ best player and leading scorer of the Federal League, was played by Canadian actor Michael Ontkean. 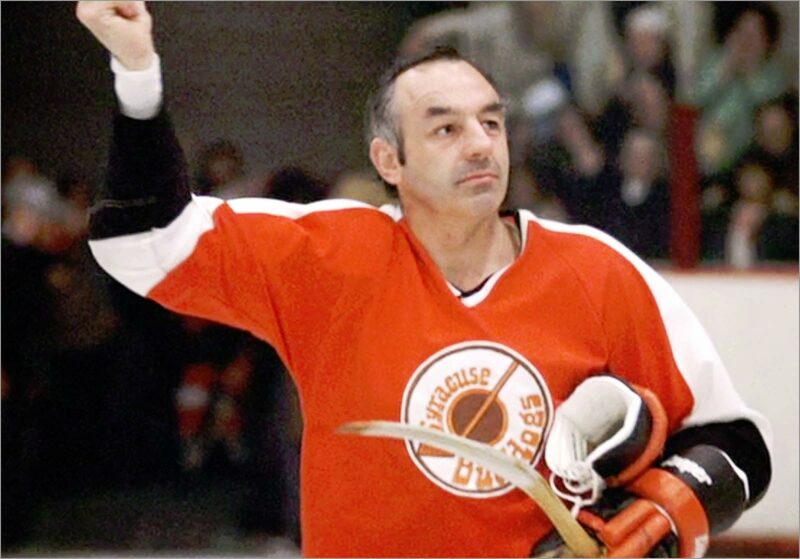 He played college hockey for the University of New Hampshire in the late 1960s and did all of his own action scenes in Slap Shot. 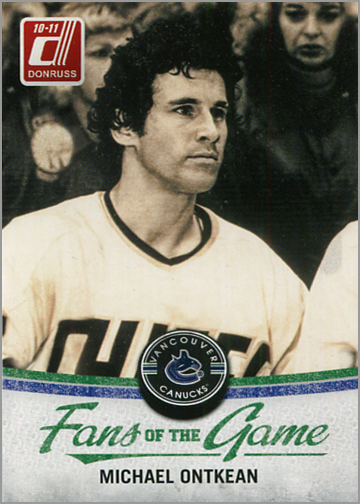 Ontkean had a card in the 2010-11 Donruss Hockey “Fans of the Game” insert set that pictures him from Slap Shot. There is both a signed and unsigned version. He also has a signed card in the 2011-12 Crown Royale Hockey set, but is pictured in regular clothes and not as a Chiefs player. When the Syracuse Bulldogs meet the Chiefs in the final game, they stock their roster with the meanest Federal League players of all time. One player was Ross “Mad Dog” Madison, played by former career minor league tough guy Connie Madigan. He spent most of his hockey career in the old Western Hockey League, but he did appear in 20 games for the St. Louis Blues in 1972-73. 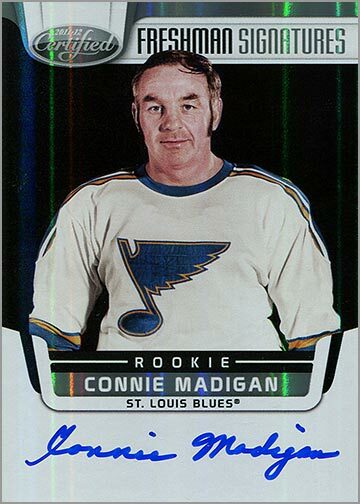 Almost 40 years later, Panini made a card of Madigan in their 2011-12 Panini Certified set. The card is autographed, and there are several different colored parallel versions of the card. At the beginning of the film, the Charlestown Chiefs are getting clobbered by the Hyannisport Presidents. One player in particular, who wears number 7, is always buzzing the net. 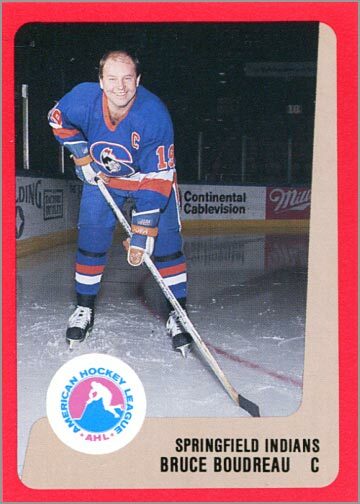 That was Bruce Boudreau — back when he had hair. Being on camera was all part of his plan. 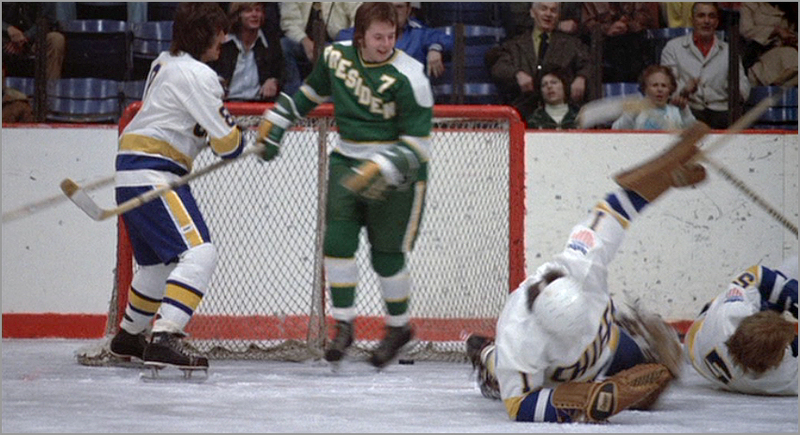 The Chiefs play the Presidents again later in the film, and if you watch closely you see Boudreau getting knocked down by one of the Hansons. Boudreau had the longest NHL career out of anyone from Slap Shot — even more so if you count his years behind the bench. He had two O-Pee-Chee cards made during his playing career, and numerous cards from his minor league and coaching career. 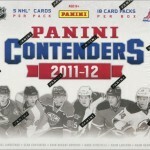 Cards of two other players would make your Slap Shot collection really complete. 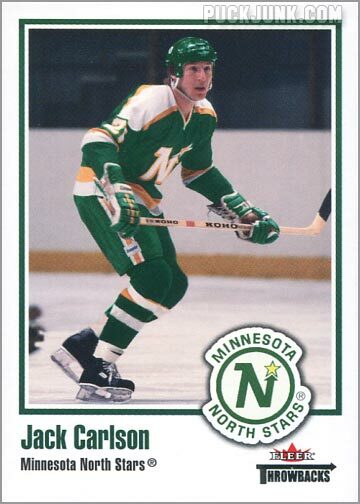 Jack Carlson was originally supposed to play Jack Hanson in Slap Shot alongside his two brothers, but was called up to play for the Minnesota Fighting Saints of the WHA. So the character that was based on him was instead played by Dave Hanson. Dave Hanson and Jack’s brothers Steve and Jeff may be famous for being in Slap Shot, but Jack had the best hockey career out of the four of them. 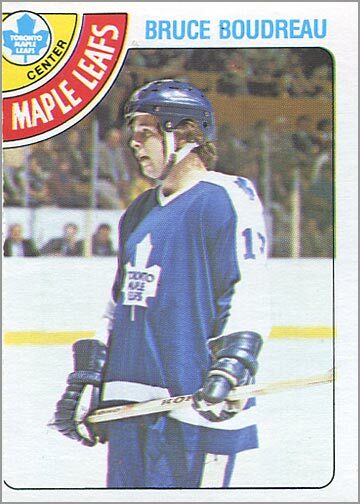 He played 272 games in the WHA and another 236 in the NHL. Jack didn’t have any hockey cards during his career, but he did finally get one in the excellent 2002-03 Fleer Throwbacks set long after he retired. 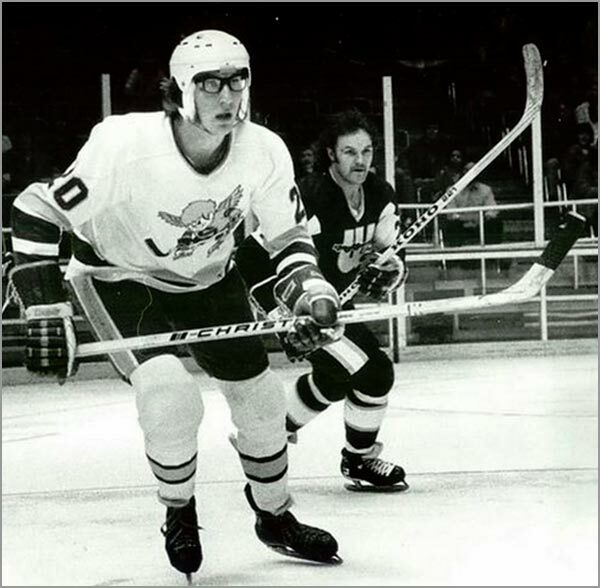 Jack may have never actually appeared in Slap Shot, but he was still the inspiration for one of the Hanson Brothers. Slap Shot was written by Nancy Dowd, whose brother Ned Dowd played for the Johnstown Jets along with the Carlson brothers, Dave Hanson and Bruce Boudreau. 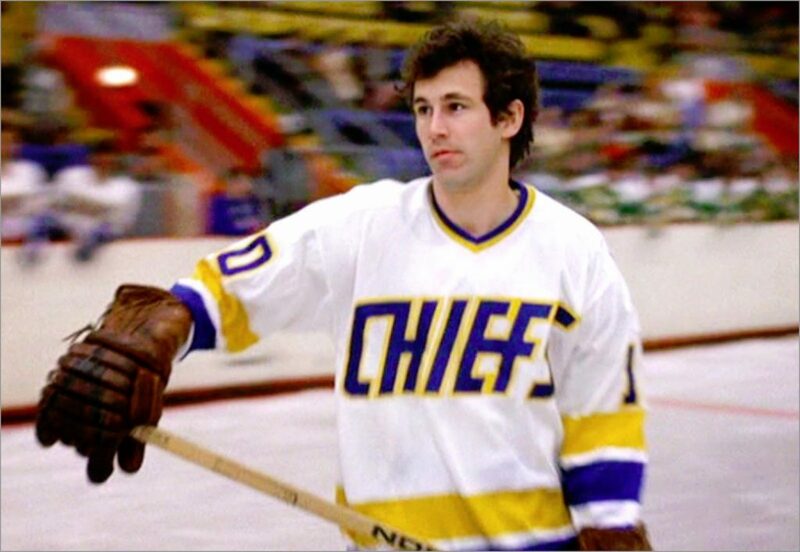 Ned Dowd was the technical adviser for Slap Shot. 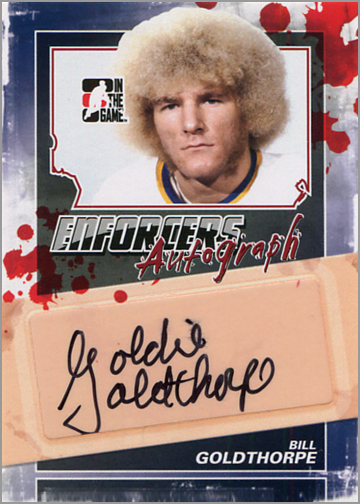 Memorably, he also played Ogie Oglethorpe, who was based on infamous minor league hockey tough guy Bill “Goldie” Goldthorpe. 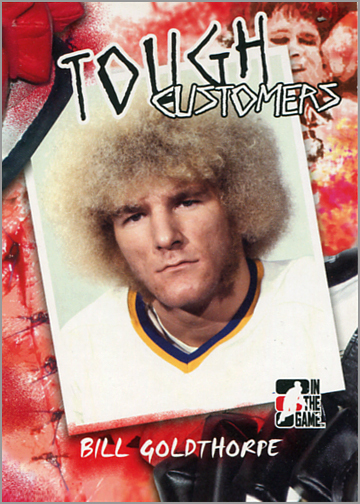 Ned Dowd does not have a trading card, but the person his character is based on has several. 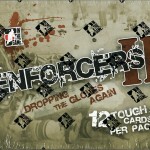 Goldthorpe first had a card in the 2005-06 Tough Customers boxed set, and appears again in the 2011-12 Enforcers set. Great post Sal. I’d like to offer another “inspiration” card from Hannu Toivonen. For a short period of time he wore as mask inspired by Slap Shot. I can’t remember too much off the top of my head but I’m pretty sure that there was an ITG card showcasing it. This would be a really fun collection to build. That sounds like an awesome card, Brett. Thank you for letting me know about it. I’ll have to find one. #50-1109 Sportscaster with Paul Newman/Slapshot movie (Finnish version, so “Lamari”). I think the date is 1980, but might be 1979. Oh THAT’S RIGHT…I saw one of those once. Now I need to get that card, too. 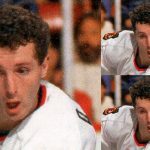 One of the Johnstown Jets players who had a fair amount of screen time and a character name (but no lines) was Guido Tenesi (a name that would have been great for the film but he was a blond pretty boy who was always looking at himself in the mirror), who played Billy Charlebois on the Chiefs. He was a Penguins pick but never got higher than the Jets; he played in Italy for some time. Doubt he ever had a card, but he might deserve mention. Hi Dejordy, and welcome to the site. Yeah, I found it annoying that certain Chiefs players like Guido Tenesi didn’t have any lines. It made it weird that some players were not vocal. Even the “quiet guy” on my rec league hockey team speaks up every now and then. Guido Tenesi *DID* actually have a sticker from a European sticker album, but it is hard as hell to find. I can’t even remember what year it is from (1983???) or what country it was made in (I assume Italy). Because of all that, I left him off the list above. I was visiting Portland, ME a while ago, and we stopped in to a Play It Again Sports (new/used sporting goods) and I almost squealed with joy when we walked in. 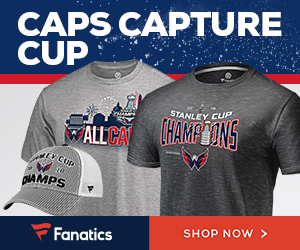 hanging from the rafters was ALL the jerseys from slapshot! 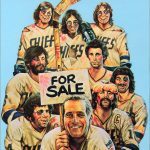 all the chiefs, Hanrahan, Ogie, Brophy… all for sale. didn’t get one sadly, but im goin back soon! 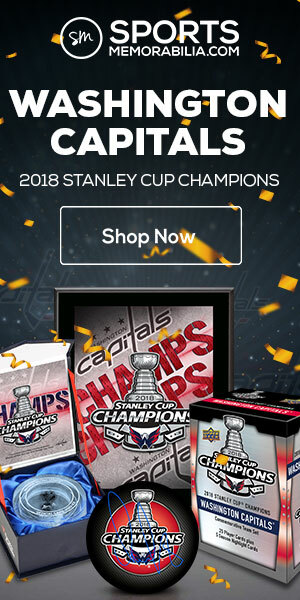 Since the chiefs are in trouble again why not join the nhl ? That would be so sweet ! I stumbled onto this thread. 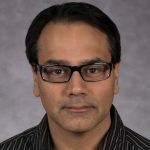 Nice read! First, I’ll confirm the Guido Tenisi stickers. They were produced by Semic, and are available with both Swedish & Finnish backs. The Finnish one is dated 1982, the Swedish is from 1983. 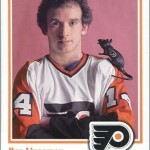 On the “related” front: You already mentioned Christian Hanson as part of the dual Pen Pals card with his father, Dave. Obviously the son had nothing to do with the movie – but building a complete nameplate from 08-09 UD Black (manufactured patches that spell H-A-N-S-O-N and are signed by Christian) looks cool. 2016-17 Upper Deck AHL had Mascot cards. One of them features the “Mullet Brothers” – The Hanson inspired mascots of the Cleveland Monsters. Leaf got into the action with their recent 2017-18 Masked Men set. Yvon Barrett has Mask inserts (many different colours) as well as autographs.